Disclaimer: Outfox is currently in a release-candidate beta stage! It probably won't horribly break anything... But I can't quite yet 100% guarantee that using it won't cause any problems at all or that it won't be incompatible with hypothetical changes to the actual release version. Make sure you're okay with the ~0.1% chance of that happening before installing! A mining-helper mod featuring the cutest pets ever! 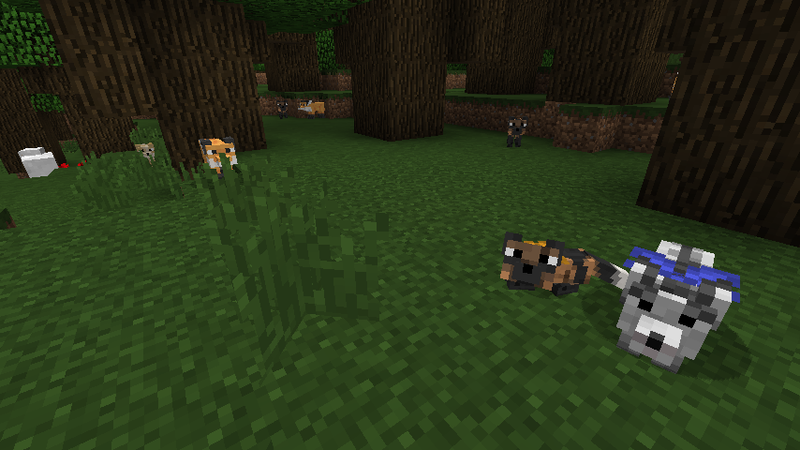 Outfox introduces clever little foxes to the forests of Minecraft. Make friends with some raw rabbit (they're shy, so be patient), and they can then fulfill the crucial duty of lying around your base being precious cinnamon rolls and making happy fluffball noises! ... Or, they can also fulfill the more practical function of being a mobile ore detector on your daring mining expeditions. 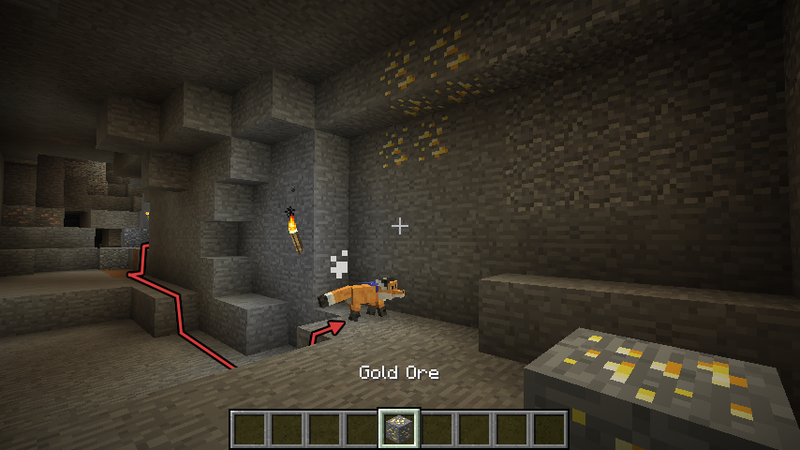 Right-click your fox with any block to set it hunting for shinies in the stone, listen for the sniffling sounds to know when it's got a whiff of more of that block, then dig into the cave walls where it leads you to zero in on loot. When you're done, shift-right-click it with an empty hand to call off the search. Thus, a cave trip is transformed from a tiresome hours-long dice roll to maybe find what you were looking for, into an adventure with a loyal and adorable friend... and a big payoff. Foxes can additionally be managed in the same ways as other pets, such as wolves: right-click them with an empty hand to let them sit and stay, with a dye to change the color of their ribbons, or with more rabbit to heal or breed them. A configuration file is included, allowing for many things to be tweaked, including (but not limited to): block searching range and interval, spawning biomes, a list of tools that should be unable to accidentally smack foxes when mining in cramped spaces, and an optional black/whitelist of blocks. Hmm, i am surprised you doesn't know, you didn't explore it. Maybe you never downloaded nothing from the internet, or just rarely? But ok, i tell you, not so hard. Go to the Files and choose the JAR in there. You will see in there a down arrow button and a download button. Not so hard. Okay so I tried downloading this mod and I got it to my launch page. But when I click on it to try and open the game it says it crashed? No matter how hard I try it keeps crashing. I don't know what to do at this point, I need help. I desperately want this mod but I dont know whats going on, is there a certain way you need to download it? Am I missing something here? I'm just so confused. I really hope this issue can be resolved. I play on a Mac as well I don't know if that makes a difference or not. Thank you for your time. I like this mod, i tested it already. But it's strange they don't drop any loot, when they die, killed by the player, they drop XP only. I mean they could drop 1, or maximum 2 leather. I mean the Minecraft standard leather. I suggest they could be tamed and mated not with rabbit meat only, it could be good, if with chicken meat too. And they could attack/kill the chickens and the rabbits, but with disappear meats after they killed them, like they ate them. The rabbit leather, the rabbit foot and the feather could stay after they killed/ate them. What do you think about my suggestions? I did set in the config they spawn common in the Forest, Forest Hills, Birch Forest, Birch Forest Hills, Roofed Forest (what was by default), Taiga, Taiga Hills, Cold Taiga, Cold Taiga Hills. And i did set them for few Biomes O Plenty biomes too, like Maple Woods, Redwood Forest, Redwood Forest Edge, Coniferous Forest, Woodland, Orchard, Snowy Coniferous Forest. 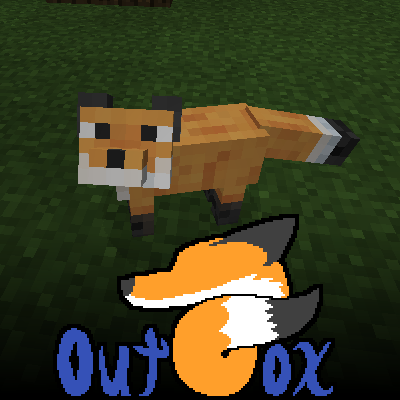 Plus i suggest to anyone to use the Natural Baby Animals mod to set in this mod's config that Outfox mod's few foxes spawn in the wild as baby fox. I tested it and it's working well too. Of course from here i downloaded, like anybody. Maybe the Mac is the problem as you said, or you use other few other mods, which ones not right with it and crashing then. You wrote down the problem now. It's because you try to run it in 1.8 version, so then Don't be surprised, if it's not working well, because that mod is for 1.12.2. But i don't undertstand why you ask me about all of that mod problem and why not the mod's creator. He/she should know about it more, i am not a mod creator, i never made any mods, i can make resource packs for Minecraft only. So i suggest ask the mod's creator here, or in PM, if the Mac, or the version difference are not the problems. Good luck! So? Why don't you say nothing? I mean to the mod's creator ItsTheKais. Please answer me and tell me what do you think about my suggestions, i wrote here few days ago! Thank you. I know you was since here online, that's why it's strange you didn't answer yet. No no, I didn't try to download it in 1.8, i tried to download it in 1.12.2 like it was meant to be. I just already had a modpack in 1.8 but i don't think it would affect anything. Also i came to you because you were the most recent comment and seemed like you knew what you were doing, also keep in mind the creator hasn't answered anyone since january. Hmm, i see. But you mistake it, the 1.8 version modpack can affect it, mainly if you try to use in the same time. You can use, play in the same time with one version only. Like 1.8, or 1.12.2. Until you use the 1.8 version with modpack, you can't use in 1.8 launched Minecraft 1.12.2 mods, or any other mods above 1.8. I thought that's logical for everybody. And then shouldn't be in the mods folder the above 1.8 mods and that's true if you launch Minecraft in 1.12.2, then 1.12.2 mods have place only in the mods folder too. And i use Forge 1.12.2-14.23.5.2814. It's working for me with that Forge version. If you use newer Forge, it can't be make any trouble as i know. Yes, the mod's creator didn't answer for me either. I don't know why, he/she is online here almost every day. After few days i wrote to him/her, i asked him/her in PM about it, but he/she didn't answer me there either, what is so strange. I didn't write him/her nothing bad. I hope he/she will answer me somewhere. Nah man i don't use the 1.8 mods. i've tried downloading in 1.12.2 but its just not working. Idk what to do. I PMed the creator and got a response so that's good, but so far little information has been given to me. But you said you use 1.8 modpack. You know that's mean you use 1.8 mods, just as in a modpack, not big the difference. So if you try to use in rhe same time an earlier version of modpack and an 1.12 mod, don't be surprised it's not working. Or the Mac. And i told you about the Forge version too. I told you everything what i could. Hmm, good fir you the creator replied to you. I hope he/she will reply for me too. I just don't see how a modpack from 1.8 could affect me downloading a mod in 1.12.2, I appreciate your help so far but it hasn't gotten me anywhere. I'm confused and disappointed because i desperately want this mod. Maybe i'll have to wait till its all done though. Also, is your first language english? I'm just wondering because your english is kinda broken but still good if it's not your first language! Thanks for the help though. I told you why can it affect for it. Because a modpack as the name say, a pack of more mods, that's why pack, it's not big difference. So it's the same you use more 1.8 mods with an 1.12.2 mod. So delete from the Minecraft's mods folder the 1.8 modpack, for example move it another folder, if you not have safe saving about it and then run the Minecraft in 1.12.2 with only that 1.12.2 mod. I am surprised you didn't try it yet and didn't think about it. So do it, good luck! Lol, 1st language. As i see, the English is not your native language either. You see it right, the English is not my native. The English people not say usually 1st language, they say native language. So then you are not English person either. Or if yes, then you are rare, who use strangely for native language 1st language.